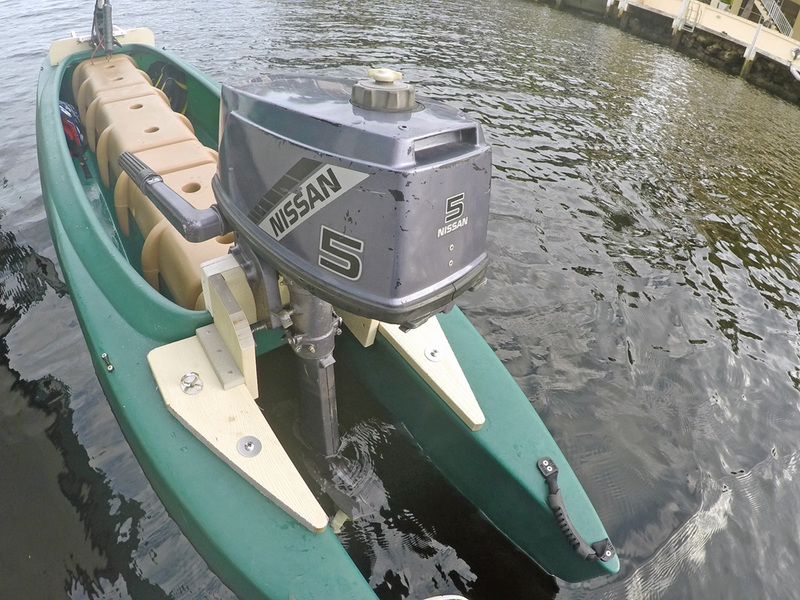 Here’s a couple quick pics of my DIY motor bracket and 5 hp long shaft 2 stroke Nissan (really a Tohatsu) outboard motor. 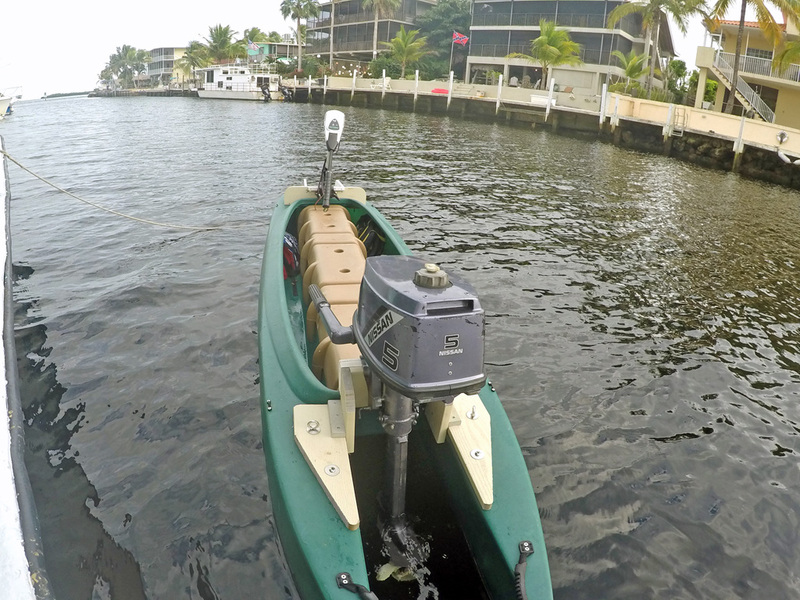 I got the refurbished motor from Brandon Kurz at BMK Enterprises near Deerfield Beach. Brandon runs an outboard and small boat repair shop near I-95. He is a great source for affordable long shaft motors for our Wavewalk adventures. The motor bracket is mostly HDPE decking material with some Azek board. It is glued and screwed with PVC cement and Torx head self tapping stainless screws. This rock solid bracket is relatively removable with only four thru bolts passing through the upper rear deck. I really don’t like drilling holes in my Wavewalks but I don’t want my Nissan passing my W700. I estimate that this rig planes at 12 knots. It is a blast to go fast in a USCG designated kayak. Obviously, a lot more sea trials have to occur. The kayak and stand-up board purists may have a hard time identifying with a cracker yakker zipping past to parts far beyond the reach of paddlers, pole pushers, and pedalers. But, although it may defy convention, having the fastest yak in South Florida does rate bragging rights. And, I have not yet begun to flout and tout my magic boat! Yes, the wind has been blowing about 15-20 kts. But, I made a PVC throttle handle extension to balance solo weight and at the edge of dark, I threw my flashlight into one of the support bracket holes to make a quick test run. The W700 was cruising so fine going downwind in North Sound Creek that I hung a right into narrow winding Taylor Creek. Maybe, the W700 was cruising 15 kts.+ in the calm flat water. It was like I had my very own X-wing star fighter flying through the tight passages. I wound back out of Taylor Creek in twilight. As I make it directly into blustery North Sound Creek, the motor slowed itself. I cranked the throttle back and putt-putted another minute or two till the motor made one last rev up as the last of the fuel vapor passed out of the carburetor. Yes, I was out of fuel. Of course I had not thrown the fuel can into the boat prior to making that “quick test run”. 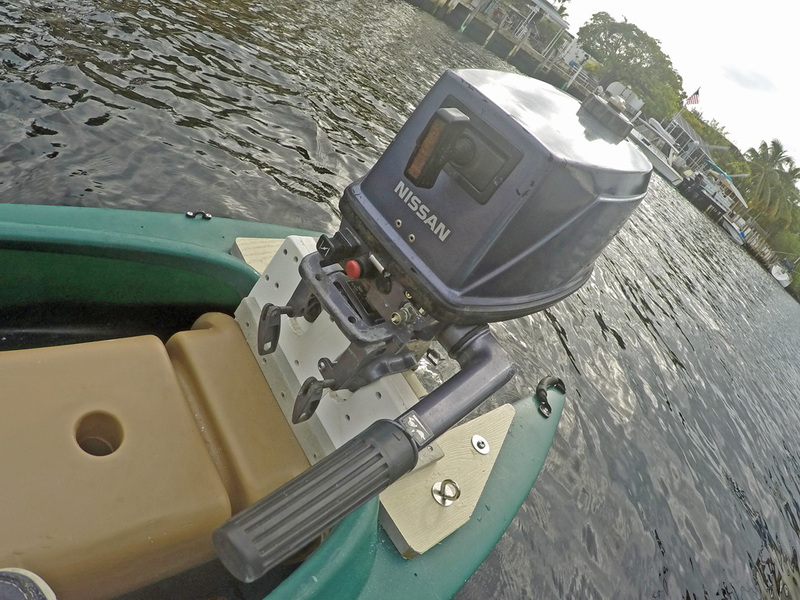 And, no, I had not grabbed a battery for the electric trolling motor. But, a canoe paddle was underfoot. So, I paddled the last mile home against that dogged wind. However, I had been blessed with an outgoing tide. Yes, paddling is important, too. And, I learned a lot about cross wind/tide Wavewalk dynamics. A grand way to get good exercise and finish the day. An epic cautionary tale with a happy ending! Hey, Larry / Yoav………Don’t give those Japanese whalers down in the Antarctic any ideas with that harpoon gun motor mount of yours. They just may stow away a few 700’s on their whaling ships. started to loose power and then out of gas.